Kurt: Welcome one and all to a special edition of the NXT Spotlight here at TJRWrestling. This is one of those days where it’s a lot of fun to write about our topic, which today happens to be previewing NXT Takeover: New York. It’s really just Takeover: Brooklyn IV, but Takeover: New York sounds bigger when it’s WrestleMania season I suppose. This card is easily one of the best ever in NXT history. John, I know you’re all sorts of pumped up for this show. If I’m not mistaken, this is the first Takeover ever with a title on the line in every match. What are your initial thoughts before we start breaking down the matches? John: It’s another NXT Takeover show with an outstanding lineup of five matches where all of them feel fresh too. Even though NXT loses talent to the main roster and unfortunate injuries are part of the business, they are still able to put together great cards for Takeover shows. Speaking of unfortunate injuries, WWE recently posted a video of former NXT Champion Tommaso Ciampa on their WWEPC Youtube channel that showed the Ciampa with his wife and baby daughter before his surgery. I encourage you to watch it if you haven’t done so already because it’s very heartwarming to see Ciampa talk about the “real Goldy” as he put it referring to his daughter Willow. The video was really well done. I’m going to miss Ciampa while he’s out of action for the next year after major neck surgery, but it’s good to know he’s got a loving family to support him. Kurt: I don’t know about you John, but it’s weird for me because Pete Dunne is one of my favorite performers in the world, yet I don’t watch NXT UK. I’ll never forget that match against Tyler Bate at Takeover: Chicago. I knew nothing of either guy and they simply blew me away. From that moment on, Dunne has been at the top of my list of guys, but it hasn’t been enough to convince me to add another hour of wrestling to my weekly viewing. Walter is such an impressive specimen. I’ve seen his battles against Keith Lee and that’s really where he got put on the match here in the states. This will be a huge showcase for him. Since NXT UK gets their own Takeover shows, it speaks a lot to how much they view this matchup to put it on this stacked card. I think it also speaks to the fact that this is finally the time for Dunne to be dethroned and get as many eyes as possible on the title change. They know they have a star in Dunne and now it’s time to make another one. I think this is a surefire title change that will blow away a lot of fans. 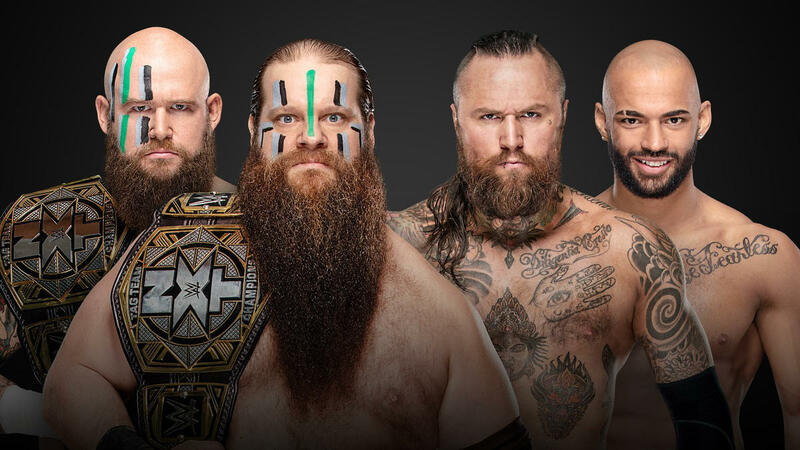 John: This should be a hard-hitting battle between a classic babyface champion in Dunne and a dominant heel challenger in Walter, who is new to the NXT UK brand. I didn’t see that much of Walter pre-WWE, but I saw enough to know that this guy is a special athlete. Walter doesn’t look like a physical specimen, yet when the bell rings, there’s nobody in WWE like him. Pete Dunne has been the WWE UK Champion since May 2017, so it’s nearly two years now. Is it the right time for a title change? I think so. Walter is a talented big man that can be a dominant heel champion for the NXT UK brand. It wouldn’t surprise me if Dunne was used on the regular NXT brand more post-WrestleMania or even on the main roster. He’s great and it’s time to drop the WWE UK Title too. Kurt: I don’t want to be “that guy”, but I’m pretty torn on this matchup. Black and Ricochet were randomly thrown together and then ended up winning the Dusty Rhodes Tag Team Classic. Meanwhile, they were spotlighted on Raw and Smackdown Live, which will clearly lead to a full time promotion to the main roster after this weekend, especially now that they’ve been added to the Smackdown Tag Title match as well at Wrestlemania. So why did the powers to be in NXT waste an opportunity to build a new, true contender for War Raiders? I would’ve much preferred Forgotten Sons or Street Profits in this spot. Yes, this will be a balls to the wall tag match and with it being Black and Ricochet in the match, it won’t get lost in the shuffle of a loaded show. I just think sometimes you need to build for the future more so than get a match that looks great on paper. It’s also too predictable, which takes away from the match as well. John: I think this is the most obvious result of the show because Black and Ricochet are likely done in NXT after this match. That means the War Raiders will win. Does that hurt the match in any way? Absolutely not. These guys are all awesome and the action in the ring is going to be incredible to watch. A predictable ending doesn’t bother me at all. War Raiders move on as champions while NXT needs to continue to build up some other teams as potential challengers. Regarding Kurt’s point, I don’t mind that it’s Black and Ricochet here. This is their last Takeover, so let’s see them go out with an excellent match against the champs. Black and Ricochet deserve a fond farewell from NXT, so that’s what they are getting. Kurt: If you take a look at our main display picture for this post, when it came out last week, there were rumors that the random ladders under the women implied they were going to update this match to a 4 way Ladder Match. As of the TV show this week, that does not appear to be happening. I don’t think it’s necessary to add ladders to this match, so I’m ok with that. This truly is a match where anyone can win, which really intrigues me. Shayna is 38 years old, so you gotta think it’s now or never for her going to the main roster. She’s run roughshod over the NXT division for long enough and I think it’s time for her to move up against some of the more established names on main roster. However, every time you think she’s going to lose the title, she keeps it. Io is the new shiny toy in the division, and even though she didn’t impress me during the MYC, she’s gotten a lot better in her time in NXT. Kairi is a former champ, but always a popular choice with the fans. All that being said, my choice for winning is Bianca Belair. She’s got everything and she’s only getting better. She’s got the character, she’s got the charisma, she’s got the attitude, and she’s got the unique power that reminds me of Chyna and Beth Phoenix. Yet, she’s more athletic than both of them. She’s Un-de-fea-ted too, in case she hasn’t told you. John, do you agree this match is wide open for anyone to win? Also, Go Vols. John: A title change seems likely here since Baszler has done all she can really do in NXT and like Kurt said at 38 years old, the time is right for her to move up to the main roster. Then again, they could consider her a NXT lifer. I don’t know what to plan is for her. Any of the other three women are a good choice as champion. I think Kairi Sane is outstanding while Shirai is very good all around. Belair has the biggest personality of all four women, so that helps her a lot in terms of being a future star that WWE can groom moving forward. I think putting the title on Belair is the right call because it’s going to elevate her to that next level. She needs it more than the others. Kurt: Somehow, someway, Velveteen Dream always ends up with the most intriguing match on Takeover. It speaks so much to his character. He’s so fluid, he can mesh with pretty much anyone it seems. I really thought he and Ciampa might have a clunker when Dream challenged for the NXT Title, just because the styles are so different, and yet to me it was the best match on the card. It’s the same thing here. Riddle is his polar opposite in personality and in style. Dream is so flamboyant and so confident in his character already, that it’s easy to forget he’s only 23 still. Riddle is undefeated, but I don’t care for how much the North American title has changed hands already when it’s still in its infancy. I’d like to see Dream barely escape a submission and turn it into a pinning predicament and barely escape with his title. They didn’t get to interact much on TV, so this feud could easily continue into the next Takeover in June. John: I’m excited about this match as much as anything on the card because of how much Dream has improved in the last two years while this could be the NXT breakout match for Riddle. While Riddle has wrestled at a Takeover before, those were just easy wins over Kassius Ohno, so I’m glad that Riddle is getting a title match. Velveteen Dream is a heel in a lot of ways, but the fans love his act so much that he’s not going to get booked by the fans in Brooklyn. Riddle will probably be more popular, though, so the fans will be heavily invested in this match. Since I’m already predicting two title changes, I don’t think they should do another title change here. Dream will retain. I agree with Kurt that this feud will likely continue into the next Takeover in June as well, which might be where Riddle wins the title. I can see Dream moving up to the NXT Title level later this year. Kurt: First off, I’m crushed that Tomasso Ciampa can’t see his title reign all the way through. Neck injuries are no joke, so I just want him to be able to come back healthy and lead a regular life. There’s no doubt that Gargano and Ciampa would’ve put the perfect bow on what I consider the best storytelling under a WWE banner in the last twenty years. However, in my eyes, the story was still able to be written completely. Gargano outsmarted Ciampa and took him out in his own game. He may not have gotten the satisfaction of taking Ciampa’s title directly from him, but winning the big one is what the finish needs to be regardless. Gargano vs. Cole in a two out of three falls match is a hell of a consolation prize. Cole was getting lost in the shuffle a little bit, so it’s good to see him back in a top match, where he belongs. With such a stacked card, I’m not sure how much time they can actually get, but if there’s a way they can get 30-40 minutes to really draw out the feature of the 3 falls in this match, I would be greatly appreciative. There’s no reason to overcomplicate this, give Gargano and the fans that have been on this ride for over a year, their moment. It might end up being the coolest visual in NXT history when Gargano gets the title in his hands. John: This will probably be the match of the night since it’s a Gargano match at a Takeover and he’s had numerous five-star matches at Takeover in the past. Adam Cole has had some outstanding matches too. They are similar in size, athleticism, in-ring style and both of them have a lot of experience too. The interesting this is for two guys that are maybe 200 pounds, they don’t really go to the top rope at all. It’s more about striking, techincal wrestling and utilizing their speed to their advantage. The 2/3 Falls stipulation is an interesting one because sometimes it helps a match, but at other times it hurts a match. I fully expect them to go 25 minutes at least and maybe over 30 minutes. Normally 2/3 Falls sees the heel (Cole in this case) getting the upper hand 1-0, then the face has to make the big comeback and that’s what they’ll probably do here. As for the winner, I’m fine with either guy winning because they are both awesome all around performers. However, I think when you remember that Gargano was likely going to win the title here from Ciampa (because they knew Ciampa needed surgery), it’s the right call to have Johnny win. Johnny has been a part of NXT for about four years, he’s done everything there is to do in NXT except become NXT Champion, so I think that Johnny should win the title here. If they prolong it for another few months, it won’t be as impactful. It’s the right time now. It’s time for Johnny Wrestling to become Johnny Champion. Kurt: That’s it for our preview of what should and could be the greatest Takeover event as we said earlier. You’re not going to want to miss it. Be sure to join me for live coverage of the event on Friday night right here at TJRWrestling! John: Thanks Kurt for doing the live coverage on Friday. My review will go up later Friday night or Sunday morning. We’re both excited and we hope you are too.